Super cool apartment, complete with a mezzanine style loft plus two bedrooms and a sofa bed meaning that there is plenty of space for family and friends . This fantastic apartment has soaring high stud ceilings which make it feel spacious and large character windows to create a bright space. Plus did we mention the peak of Rangitoto and the beautiful harbour that you get from the bedroom window? Waking up in the city does not get better than this! Elevated above everyone else, you will sleep well in your comfy queen size Japanese style bed. NOTE: there is ladder access to this mezzanine loft and so it is not recommended for children. There are modern cooking facilities so after a busy day exploring the city, you can sit back, enjoy a glass of wine and even cook yourself dinner, unless of course you would rather head out to one of the fabulous restaurants located a short stroll away. There is coffee, tea, sugar, milk, cooking basics and we always leave you some tasty snacks to enjoy. Spacious apartment in a great location in the heart of Auckland City. Mezzanine loft means that there is plenty of space to sleep a group of 6. What you see is what you get! This apartment was perfect for my family of 5. Within walking distance of the marina and great restaurants. Very clean. Thank you for your review. We are very happy to read that you have enjoyed your stay with us. We look forward to welcoming you back again in the future. The Urban Loft was perfect for the four of us in Auckland on a golfing holiday. 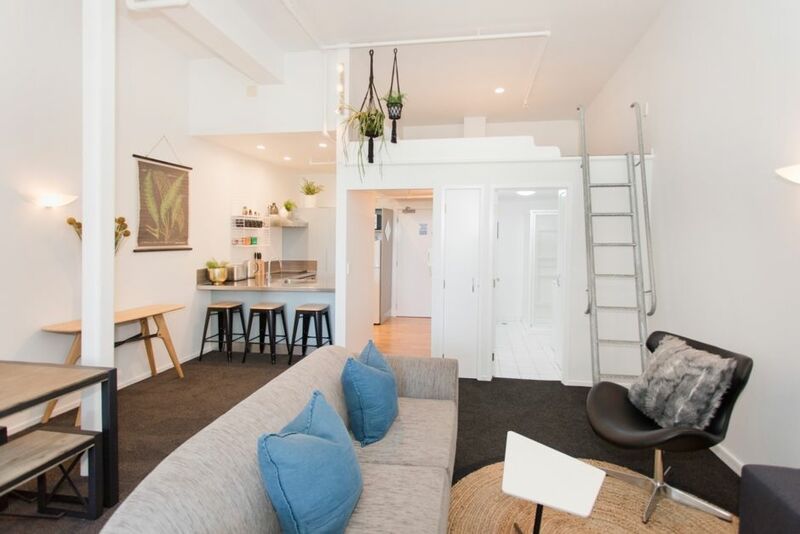 The Urban Loft was perfect for the four of us in Auckland on a golfing holiday. Th accommodation was excellent and had everything we needed. The location was excellent The only slight issue was construction/traffic noise emanating from Anzac Ave. Thank you for our stay in NZ. Great location within walking distance to everything including shopping.